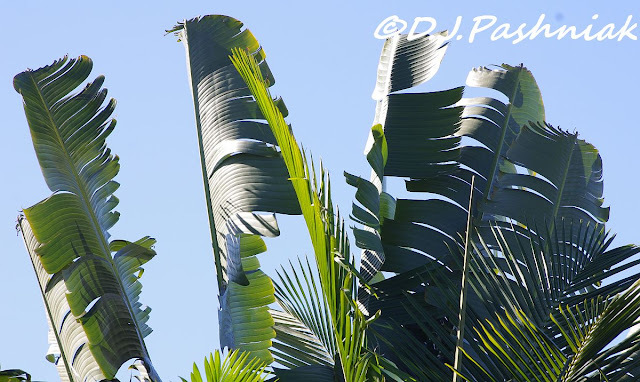 I enjoy all the palms in my backyard. When the wind is blowing the sunlight glints off the fronds in constantly changing patterns. 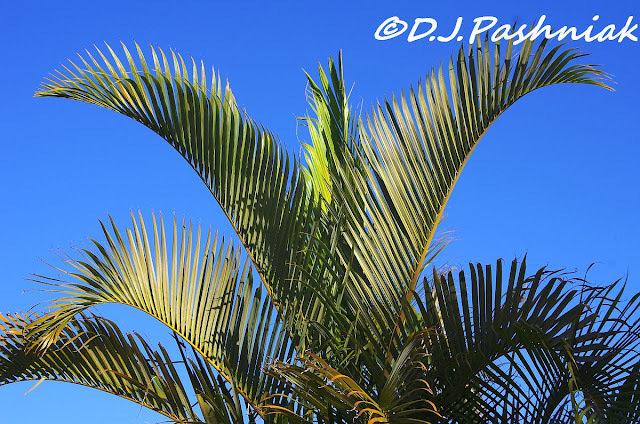 The sound of the wind through the palms is also quite different from wind through any other tree or shrub. These are leaves of the Travelers Palm with some fronds of an Alexandra Palm on the front right. 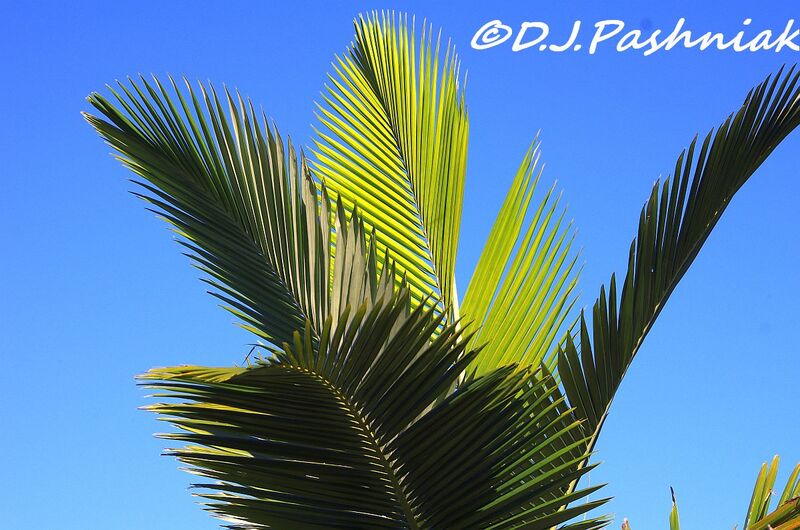 Palm fronds first come out tightly curled and sticking straight up. This is when the birds like to cling to them. 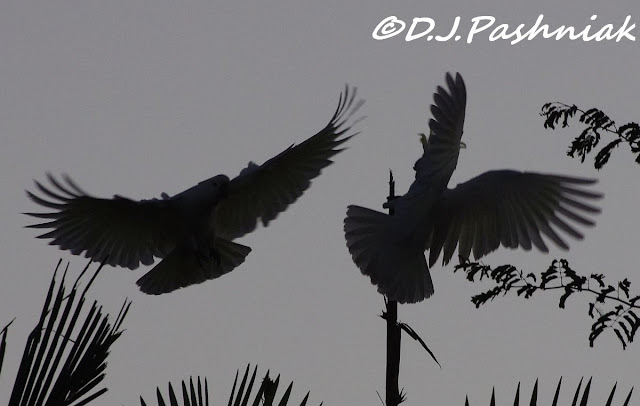 The other morning a small flock of Sulphur crested Cockatoos flew over and settled in the top of the palms at the bottom of the garden. It was very early before the sun was up so the photos are grey instead of blue and white! When "Cockies" fly in a flock somewhere they all screech as loudly as they can. I guess for them it is a way of communicating - for a human it is just pure noise! They sat up on the top fronds and jostled for the best and highest position. 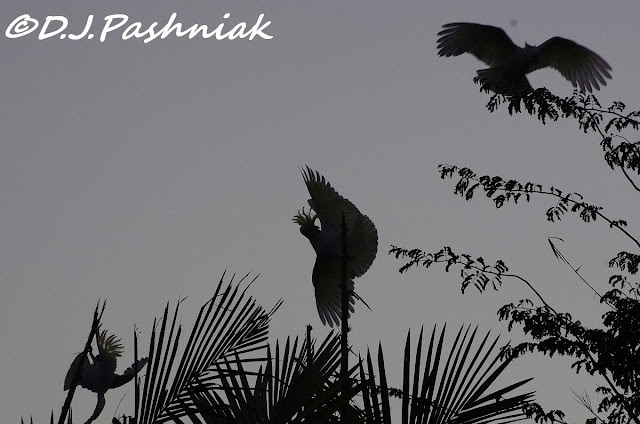 Pretty....and wonderful silhouettes of the birds stopping by for a backyard visit!! I love the palms and the Cockatoo silhouettes. Awesome series! Enjoy your day and the new week ahead! Oh, an awesome series this is indeed, Mick!! I do love them all!! Thank you so much for sharing the beauty!! I do hope you have a beautiful day and a great new week!! Enjoy!! The silhouettes make great photos. How clever of you. 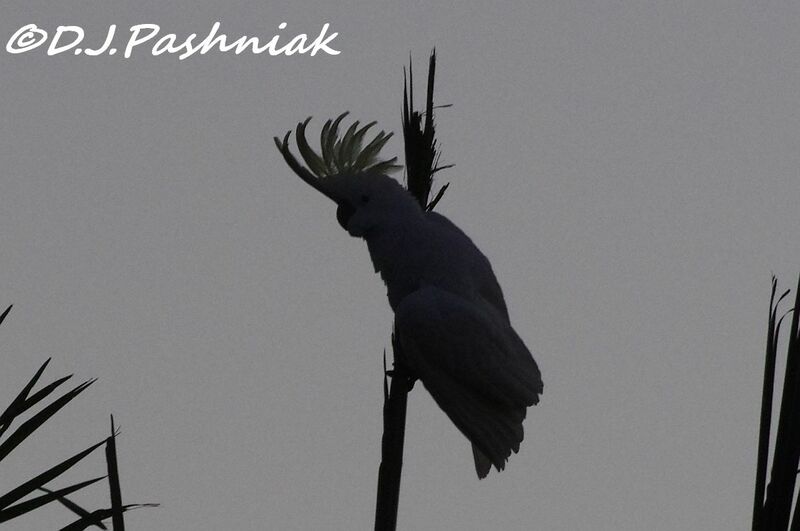 Very creative palm and cockatoos ~ Beautiful photography! The silhouettes are brilliant. The third one is an excellent composition. Nice to see the varying ferns and silhouettes of the Cockatoo. Great pictures. oh, those are neat shots! Swaying palms are a bit of a rarity around here in untropical Lancashire, as are cockatoos. Those silhouettes pictures work very well Mick. It's a lovely July day here in Ontario and I just came in from having a coffee outside on the patio - no palms though, unfortunately! The sky couldn't be any bluer. And nice touch on the b/w profiles. 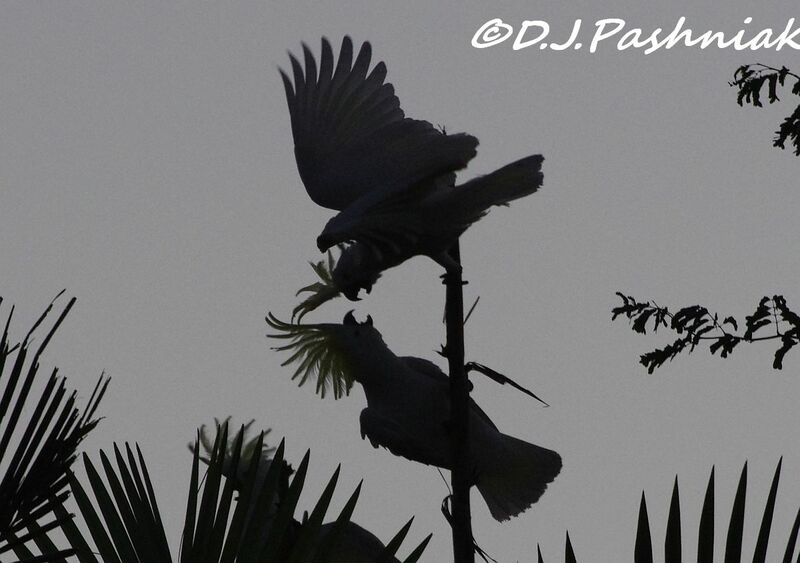 The cockatoos make very interesting silhouettes against the palms. I enjoyed seeing the palm fronds and reading what you had to say about them. They are such interesting trees! The silhouettes of the scrappy cockatoos are great too! How fun to see them in silhouette! Your yard is just a wonder! A Paradise. Nice post - I do like the silhouettes. We have just had the coldest morning in 18 years, so it feels like mid-winter in mid-winter!